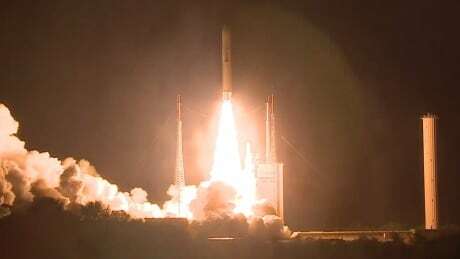 Twin probes destined for Mars were launched on Friday as a part of a joint mission by European and Japanese space agencies. An Ariane 5 rocket lift the uncrewed spacecraft into orbit from French Guiana at 9:45 p.m. ET, the start of a seven-year journey to the solar system's innermost planet. The European Space Agency says the $1.96-billion Cdn mission is one of the most challenging in its history. Mercury's extreme temperatures, the intense gravity pull of the sun and blistering solar radiation make for hellish conditions. The BepiColombo spacecraft will have to follow an elliptical path that involves a flyby of Earth, two of Venus and six of Mercury itself so it can slow down sufficiently before arriving at its destination in December 2025. Newly developed electrical ion thrusters will help nudge the spacecraft, which was named after Italian scientist Giuseppe (Bepi) Colombo, into the right orbit. When it arrives, BepiColombo will release two probes — Bepi and Mio — that will independently investigate the surface and magnetic field of Mercury. The probes are designed to cope with temperatures varying from 430 C on the side facing the sun, and –180 C in Mercury's shadow. Mercury, which is only slightly larger than Earth's moon, has a massive iron core about which little is known. Researchers hope to learn more about the formation of the solar system from the data gathered by the BepiColombo mission — the second recent co-operation between the Europeans and the Japan Aerospace Exploration Agency. JAXA's Hayabusa2 probe dropped a German-French rover on the asteroid Ryugu earlier this month.